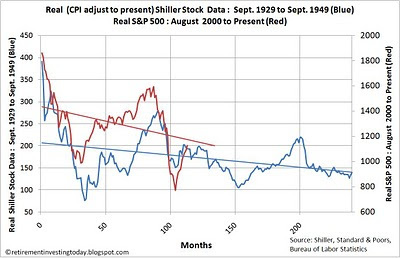 All wonderful stuff except I just don’t feel comfortable with the above chart showing progress from the Real (prices adjusted for inflation to present day) peak in 1929 taken from the Shiller dataset and comparing that with the Real (again inflation adjusted) peak in 2000 for the S&P 500. The correlation between these two periods is currently sitting at 0.65. Is the stock market out of the woods yet?